CHIIKA 100% is a multi-talented and spirit filled musician and songwriter whose aim is to always bring down God’s glory through vibrant praise and soulful worship. His real names are Chika Ezeigbo. He has a musical experience spanning over 15 years as an accomplished singer and seasoned instrumentalist. In 2008, he formed the band 100% and has since had a budding career recording his songs and performing them in churches and various gospel concerts nationwide. This year, CHIIKA100% became officially signed up to Tehila Records and is set to expand the frontiers of his listenership all over the world . 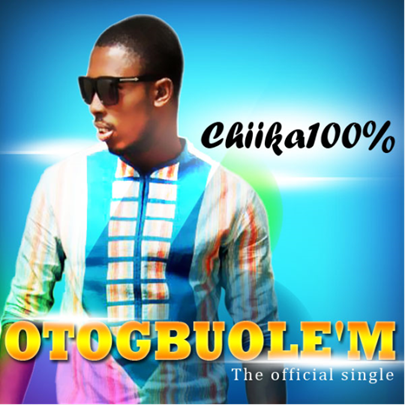 Otogbuole’m is a song that is bound to make you appreciate the wonders of God in your life and make you dance. nice video. keep it up. Lovely video.... gospel music is getting better and better....groovy! Nice but what's chika 100%?pls change that name. Gud job chika. May God take u higher. I love this. Way to go Chiika. Lovely music, keep it chika ,that's my friend singing about the goodness of christ. At this point, you're opinion doesn't count. God is using and blessing him whether or not you like his name! @King, if u don't have anytin to say pls keep quiet. I was also wondering how stupid ur name was! Very very very very lovely video....chika100 keep it up. Very nice song. Watch out for this guy. N king of kings sounds better. U must be d biggest dummy ever. Lovely piece of music. He's got a nice voice. God bless u Sapphire's boo. Lovely and captivating video, clear pictures, emotions on point and the song is very unique. I love most the wombolo stuff. Your lyrics are great. The song title is perfect too. Chika 100% is such a perfect and outstanding name and you gave the song a 100% touch. Finally, Tehila records did a superb job. Wow! am just overwhelmed. I pray for more grace to move higher and higher in doing God's business. God bless you chika. Linda, you are great too. Lovely song ... very uplifting!!! #Ossy ocGODSYN pictures. GREAT SONG + VIDEO PRODUCTION...I enjoyed it...the very best is still to come... CHiiKA100...now is your time...move forward bro! Wow! This is an awesome video... Gospel music looking good.. Great video indeed. Nice one chika. The Lord give you more grace for more. Nice one Chika. 100% perfect. The Lord give you more grace for more. NiCE 1 CHIKA!!! PERFECT!!!! MORE OF GOD'S GRACE! AMEN!!! #chikka .. M so proud of u.. Wonderfull song.. Keep it up..